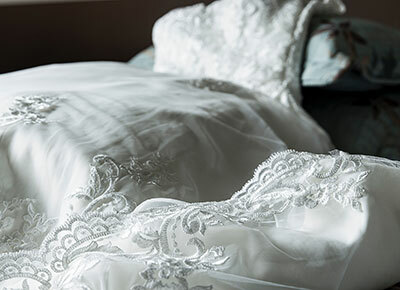 A wedding dress is arguably the most important piece of clothing you’ll purchase in your life—but that doesn't mean it has to be the most expensive! It’s actually entirely possible to score your dream dress without the quadruple-digit price tag. Here as proof, 15 fabulous frocks that come in under $500. You really can't go wrong with a fit this wha-bam! and a hook this timeless. We swoon for a glamorama train paired with dainty lacy epaulets. Getting hitched in the heat? An option like this sheer, open-back maxi lets you do the full-length thing, but comfortably. It's your wedding day—if you want to wear a chic as hell superwoman cape, well, you should. Oh yes. We're all about pared-down lines and comfy cuts for today's beach bride. Simple and statuesque—until you notice the iridescent trimming and widened straps (which also happen to be super flattering). Nothing says "dance floor-ready" like layers and layers of billowing tulle skirting. For the unabashedly modern bride: Statement shoulder, featherweight crepe and a thigh-high slit. With its intricate beading, chapel train and champagne underlay, this gown's price tag forreal looks like it's missing a zero on the end. A-line, V-neck gowns are universally flattering—but the floral embroidery on this one makes it special. Modern and minimalist...with a hint of Carolyn Bessette. Ultra-flattering flared sleeves are everywhere. Why not invite them to your laid-back wedding? OK, OK fine—we cheated our price cap here by one Andrew Jackson. But how could we not for this lacy, low-backed number that looks like it costs ten times as much? Fashun on a budget, baby.